The personal data of the visitors of this website are exclusively collected and processed in accordance with the rules of the data protection law of the Federal Republic of Germany as laid down in the provisions of the Federal Data Protection Act (BDSG) and the German Teleservices Act (TMG). 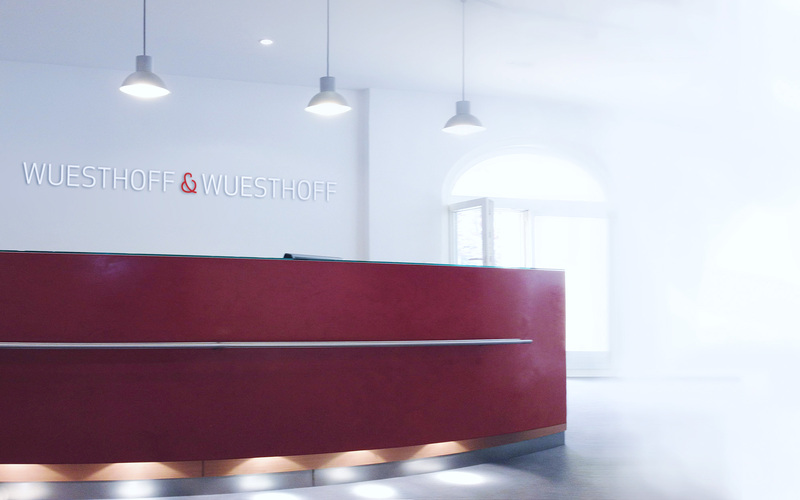 The operative Data Protection Officer at Wuesthoff & Wuesthoff can be reached at the above address, to the attention of Mr. Axel Katérle, respectively under katerle(at)wuesthoff.de. • Browser used and, where appropriate, the operating system of your computer as well as the name of your access provider. • Language and version of browser software. The legal basis for the processing of data is derived from Article 6 Paragraph 1 Page 1 lit. f DSGVO [GDPR – General Data Protection Regulation]. Our legitimate interest for the capturing of data results from the above listed purposes. In no event we use the captured data for the purpose to draw conclusions with regard to your person. In case of questions of any kind we offer the possibility to get in contact with us via a form provided on the website. The indication of a valid e-mail address, your last name with first name as well as an address is required so that we know from whom said inquiry comes from in order to respond to the same. Further indications can be made on a voluntary basis. The processing of data for the purpose of getting into contact with us occurs according to Article 6 Paragraph 1 Page 1 lit. a DSGVO on the basis of your voluntarily given consent. The personal data captured for the use of the contact form is automatically erased after completion of your request. A transmission of your personal data to third parties other than the following purposes listed does not occur. • that it is permitted by law and is necessary according to Article 6 Paragraph 1 Page 1 lit. b for the settlement of contractual relationships with you. In the cookie information is included, which results in connection with the specifically used terminal. This, however, does not mean that we obtain direct knowledge of your identity. Furthermore, for optimization of the user-friendliness we use persistent cookies which are stored for a certain specified period of time on your terminal. In the event that you visit our website again in order the make use of our services it is automatically recognized that you have already visited our website and which inputs and settings were done by you in order to not enter the same once again. The data processed by cookies is necessary for the cited purposes for protection of our legitimate interests as well as of those of third parties according to Article 6 Paragraph 1 Page 1 lit. f DSGVO. Most browsers automatically accept cookies. However, you can configure your browser such that no cookies are stored on your computer or that a note appears always prior to creation of a new cookie. The complete deactivation of cookies can lead to the circumstance that not all functions of our website can be used. The tracking measures listed in the following used by us are performed on the basis of Article 6 Paragraph 1 Page 1 lit. f DSGVO. With said tracking measures used we like to guarantee a needs-based design and the constant optimization of our website. On the other hand we use these tracking measures to statistically record the use of our website and to evaluate the same for the purpose of optimization of our offer to you. These interests are to be anticipated as legitimate in the sense of the pre-mentioned regulation. The respective purposes of processing of data and categories of data can be derived from the respective tracking tools. will be transmitted to and stored by Google on servers in the United States. Said information is used to evaluate the use of the website, to compile reports on website activity and to render services relating to the website activity and the internet usage for the purpose of market analysis and needs-based design of these internet pages. Said information may be transmitted to third parties where appropriate in case this is prescribed by law or inasmuch as third parties process this data on order. In no case your IP address is associated with any other data held by Google. The IP addresses are anonymized so that an allocation is not possible (IP-Masking). You may refuse the installation of cookies by the respective setting of your browser software; however please note, that in this case not all functions of this website may entirely be used. You may furthermore prevent the capture of data generated by the cookie and referring to your use of the website (incl. your IP address) as well as the processing of these data by Google by downloading and installing a Browser Add-on for your current web browser: (https://tools.google.com/dlpage/gaoptout?hl=de). As an alternative for the Browser Add-on, in particular for browsers on mobile terminals, you can further prevent the capture of data by Google Analytics by clicking on this link. An opt-out cookie is set which prevents the future capture of your data when visiting this website. The opt-out cookie is only valid in this browser and only for our website and is filed on your device. In case you delete the cookies in this browser you need to set the opt-out cookie again. Further information concerning data protection in connection with Google Analytics can be found in the Google Analytics Helpdesk (https://support.google.com/analytics/answer/6004245?hl=de). Data protection authorities require a conclusion of a contract data processing agreement for the permissible use of Google Analytics. Such a template is offered by Google under http://www.google.com/analytics/terms/de.pdf. On the basis of Article 6 Paragraph 1 Page 1 lit. f DSGVO we use components of the network LinkedIn on our website to make our office more known. The resulting advertising purpose is anticipated to constitute a legitimate interest in the sense of the DSGVO. LinkedIn is a service of LinkedIn Corporation, 2029 Stierlin Court, Mountain View, CA 94043, USA. Responsibility for the data protection conform operation is to be guaranteed by the provider. With each single call of our website which is provided with such a component, said component causes the browser used by you to download a respective presentation of the component of LinkedIn. By this action LinkedIn is notified which concrete site of our web presence is actually visited. If you click the LinkedIn “Recommend-Button” while you are logged in into your LinkedIn account you may link the contents of our pages of our website to your LinkedIn profile. By this, LinkedIn is in the position to attribute the visit of our pages of our website to your LinkedIn user account. We have neither influence on the data captured by LinkedIn nor the amount of data captured by LinkedIn. We have also no knowledge of the content of the data transmitted to LinkedIn. Details for the capture of data by LinkedIn as well as concerning your rights and opt-out possibilities can be derived from the data protection notices of LinkedIn. These indications can be found under http://www.linkedin.com/legal/privacy-policy. • according to Article 77 DSGVO to lodge a complaint with a supervisory authority. As a rule you may contact the supervisory authority of your habitual place or work place or our office. In the event that your personal data is processed on basis of legitimate interests according to Article 6 Paragraph 1 Page 1 lit. f DSGVO you are entitled to the right to file an opposition against the processing of your personal data inasmuch grounds are present which result from your personal situation or the opposition is directed against direct advertisement. In the latter you have a general right to objection which is implemented by us without indication of a special situation. In case that you want to make use of your right of revocation or objection, an e-mail to wuesthoff(at)wuesthoff.de is sufficient. During visiting of our website we use the commonly known SSL method (Secure Socket Layer) in connection with the highest encryption which is supported by your browser. As a rule it refers to a 256-Bit encryption. In the event that your browser does not support a 256-Bit encryption we refer to a 128-Bit v3 technology instead. Whether a single page of our web presence is transmitted encrypted can be recognized by the closed representation of the key – respectively lock symbol in the lower status bar of your browser. Furthermore, we use suitable technical and organizational security measures in order to protect your data against accidental or intentional manipulations, partial or entire loss, destruction or against unauthorized access by third parties. Our security measures are constantly improved according to the most recent technological development. This data protection declaration is currently valid as per version of May 2018. By the further development of our website and offers about it or due to changed legal respectively official instructions it may be necessary to change this data protection declaration. The currently valid data protection declaration is available on our website under https://www.wuesthoff.de/datenschutz/ and can be retrieved and printed out by you at any time.